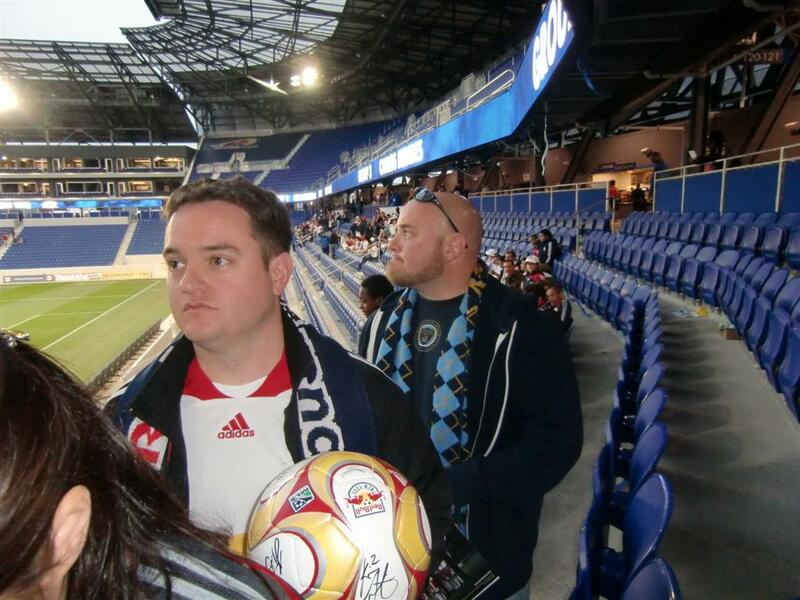 Red Bulls vs Philadelphia: The Rivalry Begins! In what will probably become one of the more heated rivalries in MLS, if only because of the proximity between the two teams, the Red Bulls took first blood as they defeated the Philadelphia Union by the score of 2-1. As was the case last week, another bail-out was needed. First, the Philly coaches inexplicably took out their best player at the half. Then, with full time fast approaching and both teams deadlocked at 1 all, Philly defender Michael Orozco gifted us a penalty. It seems Mr. Orozco forgot that little rule about not touching the ball with your hands inside the box. The great Juan Pablo Angel put it away and it was the Red Bulls taking all three points on offer. The Cathedral of Football, Red Bull Arena (built by Makita), is shaping up to be a Fortress on the Passaic, as no visiting team has taken any points yet. Hopefully, that that will remain the norm for a long time to come, but that might be wishful thinking on my part. But whatever! Please check out the above video for some drunken pre-match comments and predictions. Please click here for half-time comments (w/special guest Johnny Toro, who, btw, now has his own Facebook Fan Page) and click here for my view of the penalty and full-time comments. 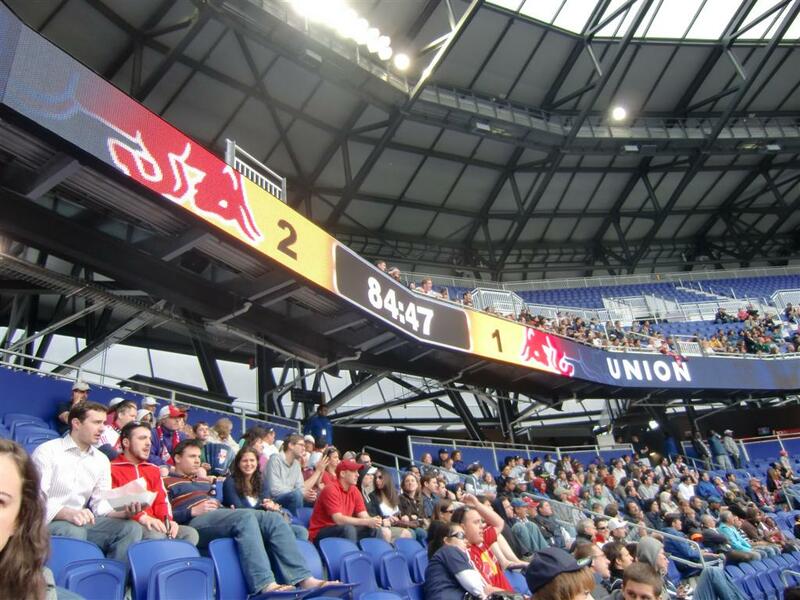 The Red Bulls return to action @Red Bull Arena this Tuesday (April 27th, 8pm), again versus the Philadelphia Union, in a preliminary round US Open Cup match. I'm hoping for another win, however... Mr. Backe has indicated that he'll be using mostly reserves against the Union on Tuesday, while Peter Nowak has indicated that he'll be putting out his best team for the match. Attendance was not up to expectations for this rivalry match. 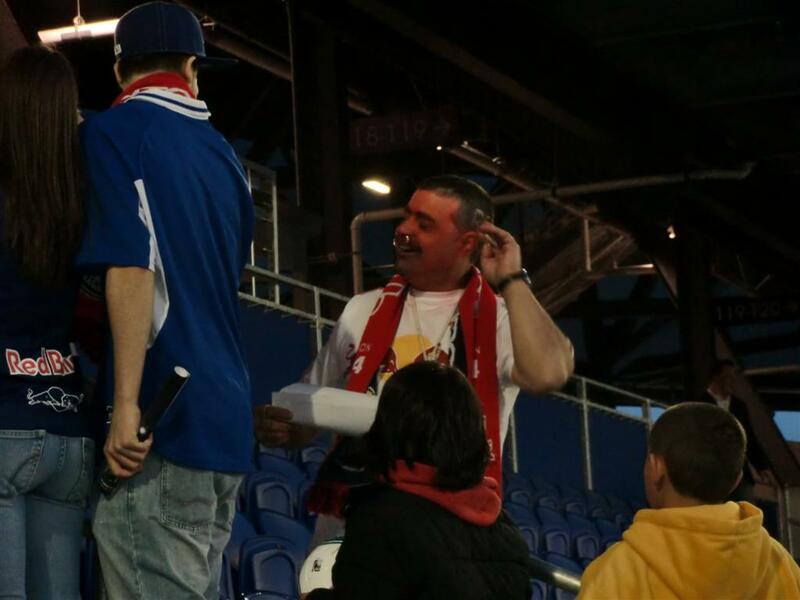 Still the 15,619 on hand provided a great atmosphere and a real homefield advantage for the Red Bulls. I'll take a crowd just like that for the rest of the season, although I'm hoping the Red Bulls break the 20k average attendance barrier this year. That might not be too far fetched, if they can aquire a couple of big time players. 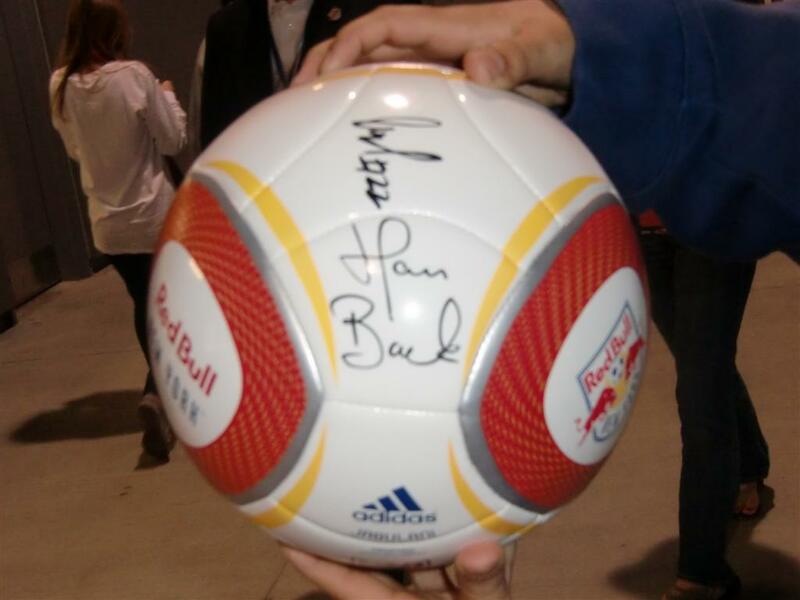 Lucky for us Red Bulls fans, the likelyhood of that happening (after the World Cup) is, actually, very, very high. After the match, it was time for the annual Meet The Team Day. Pretty well organized, I guess, and my kid got several autographs. As we made a line to get some, I noticed the guy in the above picture (The one decked out in Philly Union gear) on the line with us. Here he is again, at Tchani's table. I mean really... WTF???? There was also a Fake Toro walking around, if you can believe it. Please click here for my extensive gallery of Match/Meet The Team Day photos, or click here for the slide show. 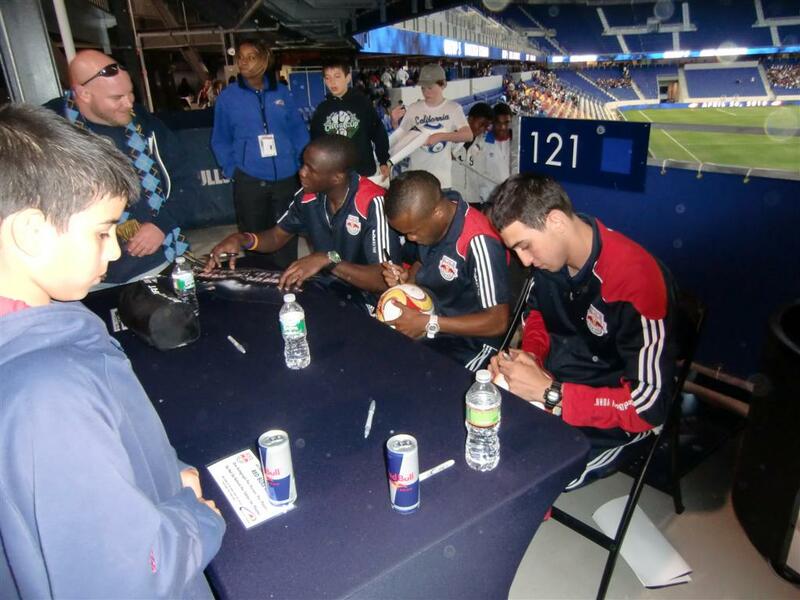 Also, check out this great gallery of photos, courtesy of the Red Bulls Facebook Page.